true stories of Christian heroes! When Hitler's madness invaded Holland, Corrie ten Boom (1892-1983) and her family risked everything to extend God's hand of love and protection to their Jewish neighbors. Corrie's life is a testimony of forgiveness, compassion, and courage to do what is right. "No pit is so deep," she believed, "that God's great love is greater still." 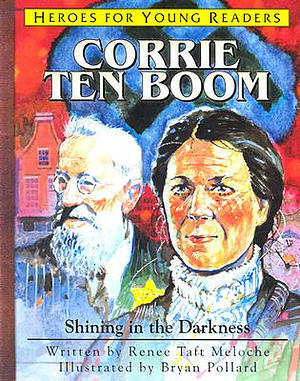 Corrie Ten Boom: Shining In The Darkness by Renee Taft Meloche was published by Frontline Communications in October 2001 and is our 19830th best seller. The ISBN for Corrie Ten Boom: Shining In The Darkness is 9781576582312. Be the first to review Corrie Ten Boom: Shining In The Darkness! Got a question? No problem! Just click here to ask us about Corrie Ten Boom: Shining In The Darkness.